Barbecued chicken on the grill has always been a favorite summertime food, but when improperly grilled, it can make your backyard cookout anything but memorable. This informative video demonstration shows you the secret to grilling up perfect barbecued chicken every time. Your barbecued chicken is guaranteed to be moist and tender without that burnt barbecue sauce taste that often occurs when grilling barbecued chicken with other methods. Hello! This is Chef John for Foodwishes.com with my version of barbecued chicken, and I'm sure you've been sitting around thinking, "I wonder how Chef John does barbecued chicken?" Well, here's my method of getting delicious barbecued chicken without that black, burnt skin. So, I have a chicken, a whole chicken that was cut in half; or you could do it yourself, or you know, buy it that way. I'm going to make some deep slashes: a couple in the breast, a couple in the thigh, one on the leg... Now, what those slashes are going to do is to allow the marinade and the barbecue sauce to permeate the bird. All right, and I'm also going to cut the wing right there at that first joint just to make it grill easier. Don't throw those away; we'll grill those later. All right, in a bowl I have crushed garlic, a quarter-cup of rice vinegar, and then a few tablespoons of barbecue sauce. And, by the way, I have a very exciting barbecue sauce announcement coming soon, so stay tuned for that. 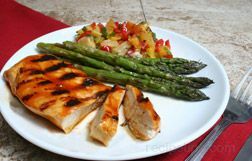 Now, what you're going to do in this very simple marinade...again, it's just the barbecue sauce; a little vinegar, rice vinegar, which is got a nice sweet, salty flavor; and garlic, of course...we're going to swish around our slashed chicken. All right, once it's all coated, you're going to leave it slashed side down, and just refrigerate that for one hour. That'll give you time, you know, to build the fire and do the other stuff. After the hour, you want to pat it dry; we don't want it wet, so I'm just using a few paper towels here. All right, so once it's patted dry, we're going to dust it with a very basic barbecue dry rub, which of course, I will have the ingredients for on the Website. Why...why would I keep that a secret? So, go to the Website, Foodwishes.com, and you'll get those ingredients. All right, out to our already hot grill. Now, here's the secret to my barbecued chicken. I'm just going to mark the skin side for like, I don't know, three, four minutes; just get those nice black grill marks...that nice char look. I'm going to flip it over, and I'm going to cook it the entire rest of the way that direction. That way, I can keep brushing on my barbecue sauce every, I don't know, six, seven minutes, and build up a beautiful thick barbecue sauce layer without burning it; because if you cook this with the lid down, it will cook all the way through in probably, I don't know, I'm going to guess in about thirty-five minutes; depends on the size of your chicken. Are you...you can tell when your chicken's done, right? You can use a thermometer if you want, one seventy. So, I'm going to close the lid; I'm going to close the vents so it's just barely open, and that's going to kind of smoke and bake, and you don't need to turn it again. People turn it, and the barbecue sauce...that beautiful, glistening, lacquered layer of barbecue sauce they've built up...just incinerates in like four seconds. What a waste. Okay? So a little black around the edges is fine, some black grill marks is fine, but you don't want the whole chicken to be black, so keep painting on the barbecue sauce, closing the lid, let it cook for another six or seven minutes. By the way, see the wings I put on there? That's my snack. Time for a wing break! Okay. So, about thirty-five minutes later, my chicken was done, I'm going to take it off; I'm going to go inside, and, you know what? I'm going to eat. So, that's my method for barbecued chicken, very simple process: you slash it, you marinate it, you dry it off, you grill it, but only for a few minutes on that one side with the skin, so it looks beautiful like that; then flip it over, paint on the sauce, and just basically roast it in your barbecue. That works whatever your favorite barbecue sauce is, and like I said, stay tuned for a very exciting barbecue sauce announcement. So, go to the site, get all of the ingredients; there's only a few, but I'll show you what's in that dry rub. And as always, enjoy!